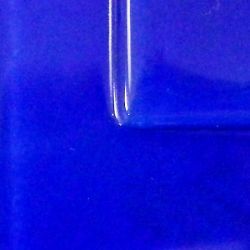 Glossy, semi-opaque dark blue when applied in the traditional "puddle, push, pull" method. Mix 1:1 with Medium. Color should self-level when applied to surface. Color is purple until fired. Since color is purple until fired it is hard to use this one for color mixing. Mix with Layering Mix (ratio depends on technique) when you want to be able to add "layers" of color on top of one another for one firing. Thin layers of color can be applied by mixing with Layering Mix instead of Medium.